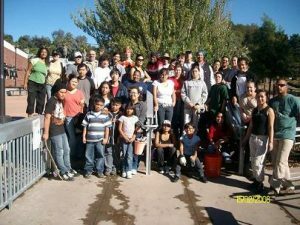 Our Saturday, November 15 volunteer day had a fantastic turnout- nearly 40 enthusiastic volunteers showed up to plant more than 200 native plants. The Rheem Creek Habitat Restoration and Watershed Education project is the culmination of years of engagement with the Rheem Creek watershed and its residents. Together with the Natural Heritage Institute, UCC helped facilitate the Rheem Creek Vision Plan, a community visioning and watershed assessment project that helped prioritize projects in the watershed. 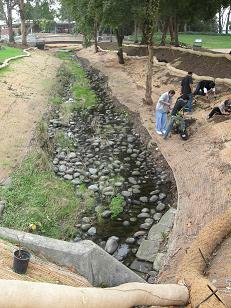 Funded by the State Coastal Conservancy, Nature Restoration Trust and Rose Foundation, among others, the project had two main components: the revegetation of 500 feet of stream channel on the Contra Costa College campus and a student intern program that employed student-interns in an environmental education program.